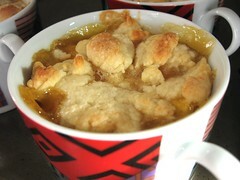 Curried Peach Cobbler - Do You Know The Muffin Man? Notes: I found this old cookbook at the Mississauga Symphony Used Book Sale last night. Inside was a Curried Fruit Cobbler made with plums and peaches. In this rendition, I made half the recipe using all peaches, recycled leftover pie dough scraps for the topping and baked it in three 6-oz. oven-proof cups for 25 minutes. The curry flavour is subtle, adding an exotic taste and gentle warmth. Very yummy, especially right out of the oven.